Family portrait of the Edwards family probably taken around 1919, just prior to Melora Edwards' death. 1906. The City of Vancouver was barely twenty years old and growing quickly. The Klondike gold rush in 1896 and the terminus of the Canadian Pacific Railway in Coal Harbour were bringing thousands of newcomers to this bustling port city. 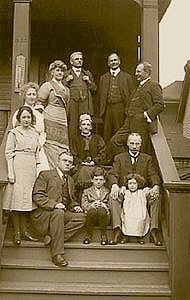 The Edwards family, from Belleville Ontario, arrived in 1891. 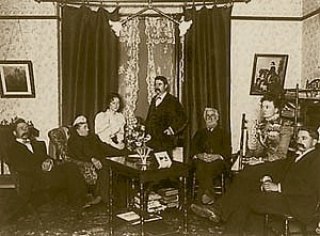 Melora Edwards, the matriarch of the Edwards family, built the house as 1362 Haro Street on the death of her husband in 1906. She went to some effort to build a sturdy family home for her three remaining unmarried children, Herbert, Arthur and Louise. Her sons Edgar and George were the owners of the Edwards Brothers Photography studio on Cordova Street. 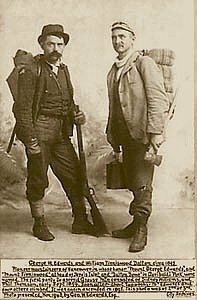 They were quite successful as portrait photographers but they also documented some spectacular events. They photographed the damage to the Canadian Pacific Railway by the Fraser River flood in 1894 and George traveled to the Yukon Territory to witness the Klondike gold rush. Some of their photographs of early Vancouver and colonial British Columbia hang in our second floor hallway. Photography was not the only interest of the Edwards. 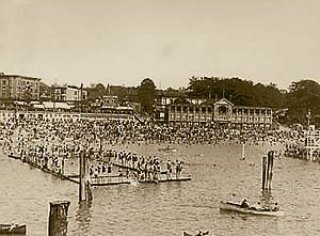 They had a steam boat called the Beaver, named after another more famous boat that, some years earlier, had washed up at Siwash Rock - a vantage point on the Stanley Park Seawall. Day trips with young people, duck hunts and other excursions kept them busy. As in many influential houses in Vancouver at the turn of the century, the Edwards had some interesting visitors. Pauline Johnson, the famous Canadian Indian Poetess and lecturer was a friend of Melora's daughter-in-law, Rosalind Webling. As a young woman, Pauline performed her poetry throughout North America. In the first part of her act, she would recite in regular clothing, then change into a hand-made Native costume for her Native poetry. In 1909 Pauline retired to Vancouver and published extensively in the Daily Province. Her stories were largely based on legends her friend Chief Joe Capilano of the Squamish people recounted. It was she who named "Lost Lagoon" at the entrance to Stanley Park. She died in Vancouver in 1913 and there is a commemorative spot in Stanley Park where she asked to be buried. Pauline Johnson is the only person who has been given this honour. Rosalind Webling, who married George Edwards in 1898, was a some-time actress from England. Her relationship with Melora was somewhat rocky as a result of her ‘stage-actress’ past. She, along with her two sisters, enjoyed some success on the stage, with performances consisting of selections from famous plays and recitations of prose and verse, all done in appropriate costume. While in England, Rosalind and her sisters were acquainted with John Ruskin, the famous English art critic. She and Ruskin would go for walks on the moor and converse during the month the Weblings stayed at his Brantwood estate. Rosalind and George Edwards had three children, Lucy, Ruskin, and Florence. Melora lived in the house for 13 years, until her death in 1919. Arthur Edwards continued to live at 1362 Haro Street until 1964. He was succeeded by Bea Currie who bought the house and lived there until 1984. At that time, George Weigum and Charles Christie envisioned the house for travelers and thus created the West End Guest House. The house became the Pink Victorian, Vancouver's first large bed and breakfast. George and Herbert Edwards opened Vancouver's first photography shop in 1893 on Cordova Street. Later the shop was moved to Granville Street. Many of Vancouver's early historical photographs were taken by the "Edwards Brothers." The second floor hallway at The West End Guest House is filled with historical photos of Vancouver.